You know how it goes…I got a little busy with outside things, and maybe I neglected my stash closet just a little too long. 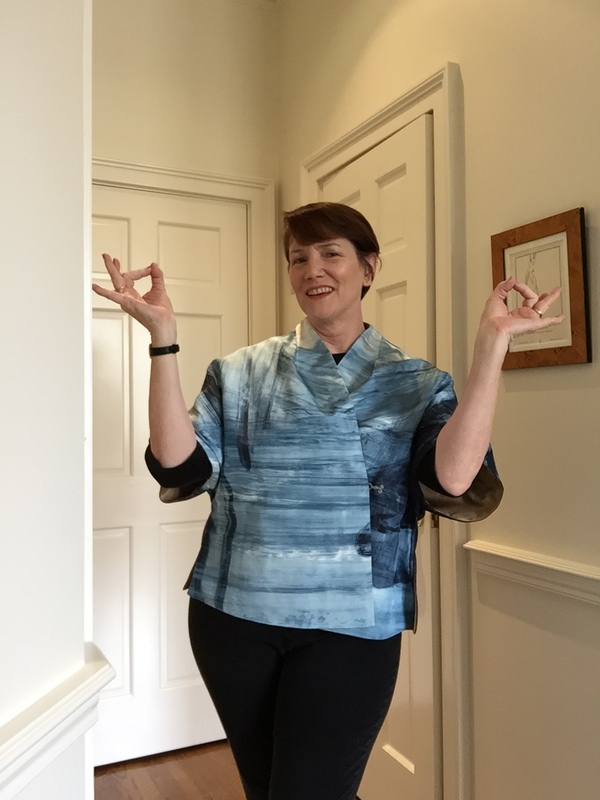 Before I knew it, my fabric, patterns, UFOs and other items had started acting out like naughty teenagers. 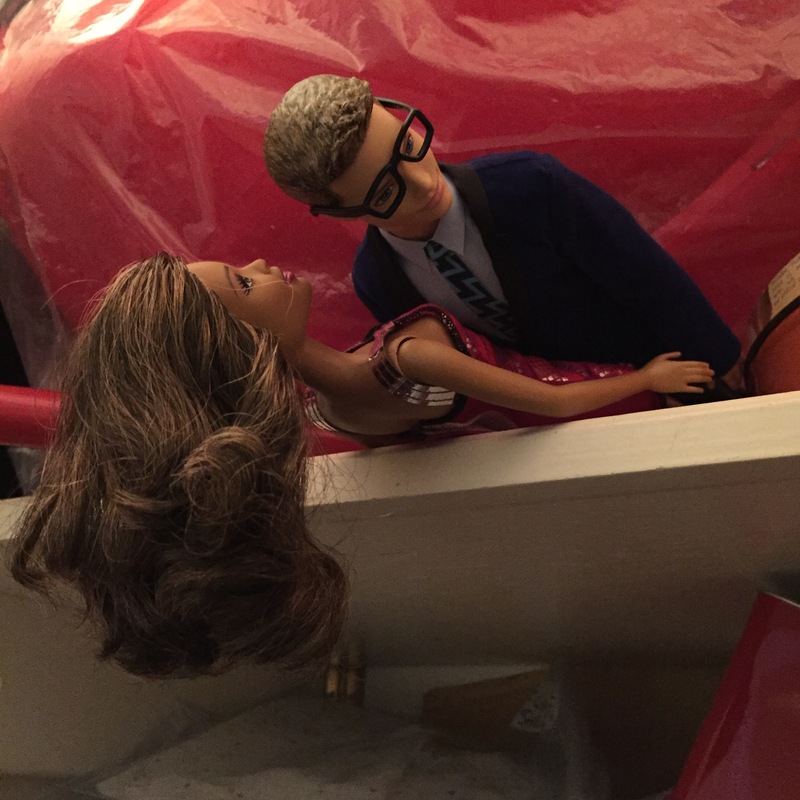 For example, When I looked up on the top shelf, I caught Yves St. Laurent and Halstonette in flagrante delicto under my dressform, AKA “Debbie Reynolds.” And they don’t get along at all! You two! Well, something had to be done. 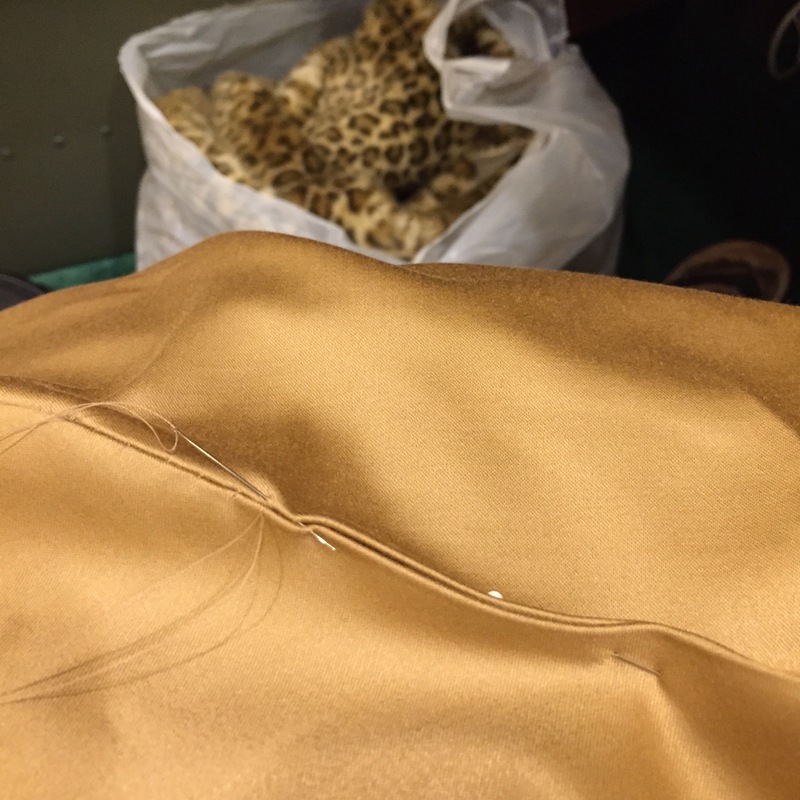 I knew the cause of it all was the evil UFO (unfinished object) from before the holidays, the 50s “Opera Coat” renamed “Bea Arthur’s Spa Robe.” I had to finish it, because all hell was breaking loose in my stash closet. My fatal mistake had been rushing through and not taking time to fit it. By the time I’d lined it and understitched, it was too late. After that, I tried fiddling around with it to make it presentable, and even considered giving it some Issey Miyake pleats and folds to update it. 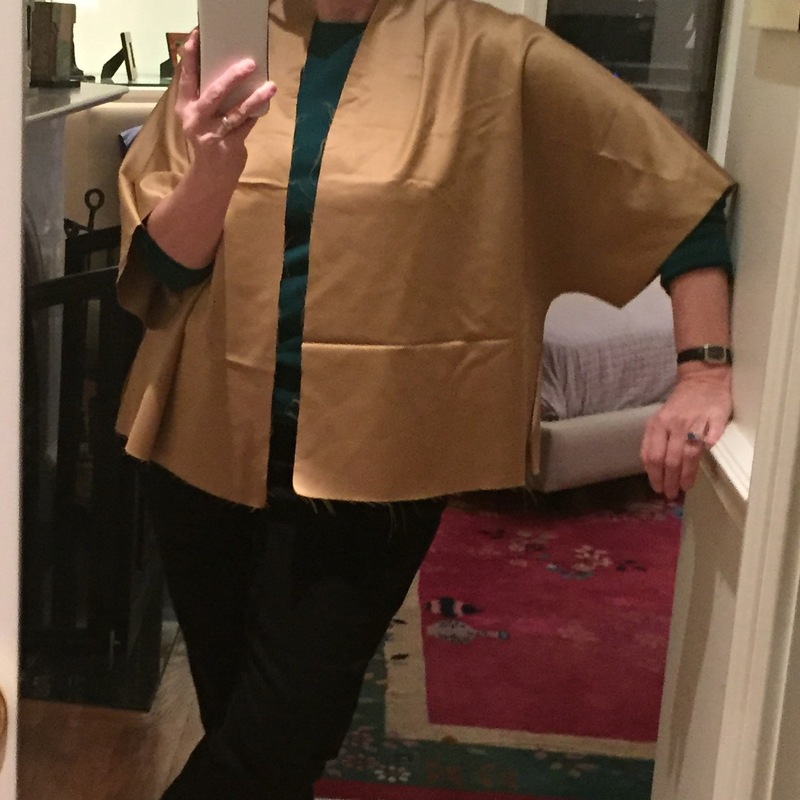 But then, instead of looking like “Grandma Goes Trekking in Thailand” it had that air of “Grandma Goes Off Her Meds,” so I went to plan B.
I ended up crossing it over in front and sewing on a big covered “fur” hook and eye. I was going to do a row of them, but quickly lost interest. Ohm MG! Right up there with the “Schiaparelli Mom Jeans Vest” from last fall. By then I was about to call the Ghostbusters to straighten things out in my stash closet, but decided to make a last-ditch effort to improve my sewing karma. 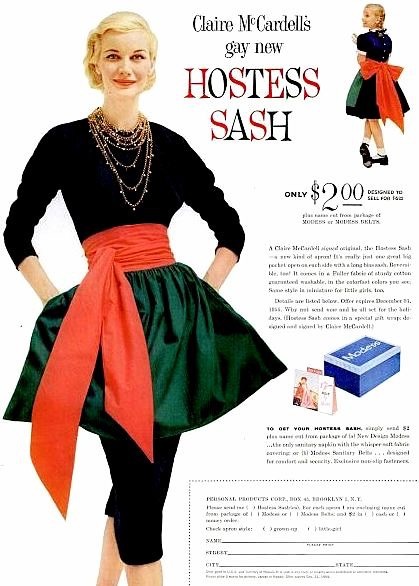 I had been wanting to hack “Claire McCardell’s Gay New Hostess Sash” from this 50s ad for the longest time. You would send in $2 and a boxtop from Modess Sanitary Napkins to get an apron with pockets and double-wrapped sash. It was designed for the woman who did her own cooking but had to look good to entertain, based on McCardell’s “Kitchen Dinner Dress” concept from the 40s. 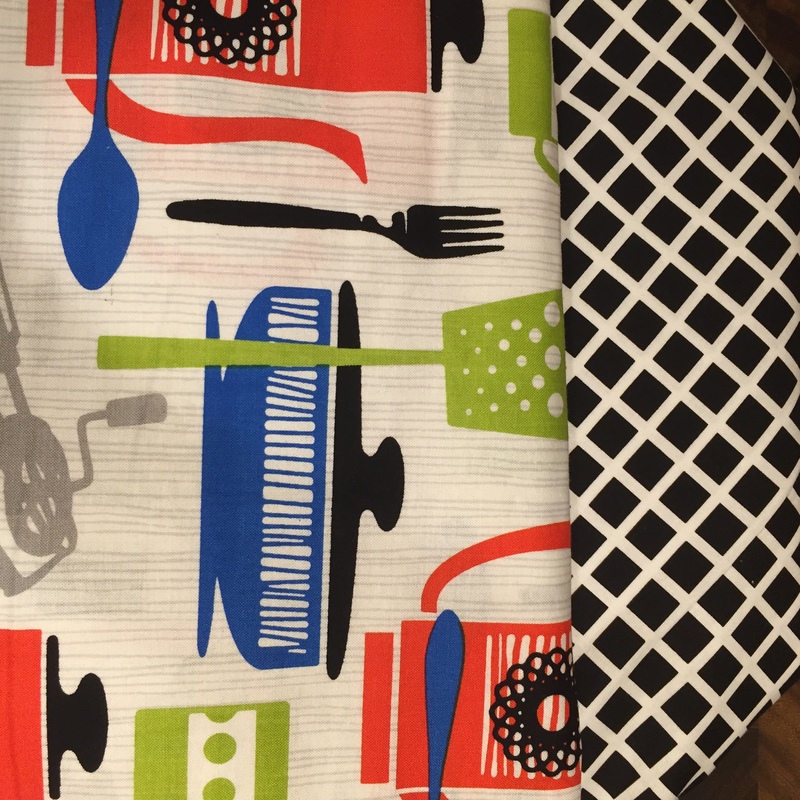 I found some fun retro quilting fabric, cut a long bias sash, and gathered the apron part using dental floss. You can find my tutorial about that trick here: Gathering with dental floss tutorial. #mintyfresh ! Eek! 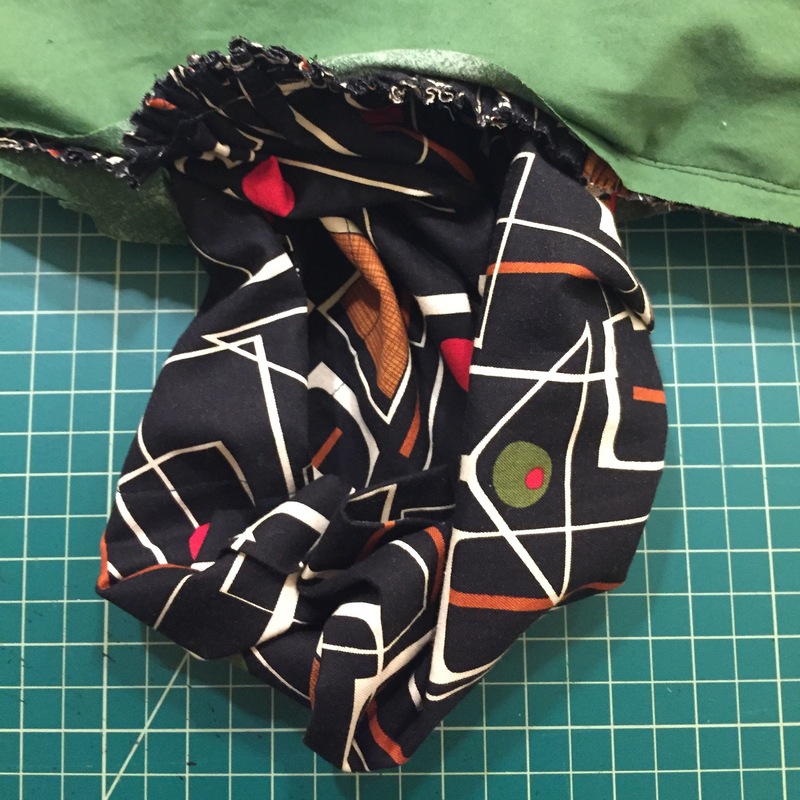 My apron gave birth on the cutting table! My stash really was possessed. That “Alien” maneuver seemed to have calmed things down, though, and this “make” turned out A-OK. I was about to be good and leave empty-handed, until Deepika helpfully pointed out the remnant rack. Come to Mama! (For some reason that picture’s sideways, so just turn your head a little to the right to get the idea.) I feel another apron coming on! I defrosted my hands and typed up a quick tutorial for the beach wrap, which is super easy to make and modify for all sizes. You can find it here on WeAllSew.com: Retro Beach Wrap Tutorial. 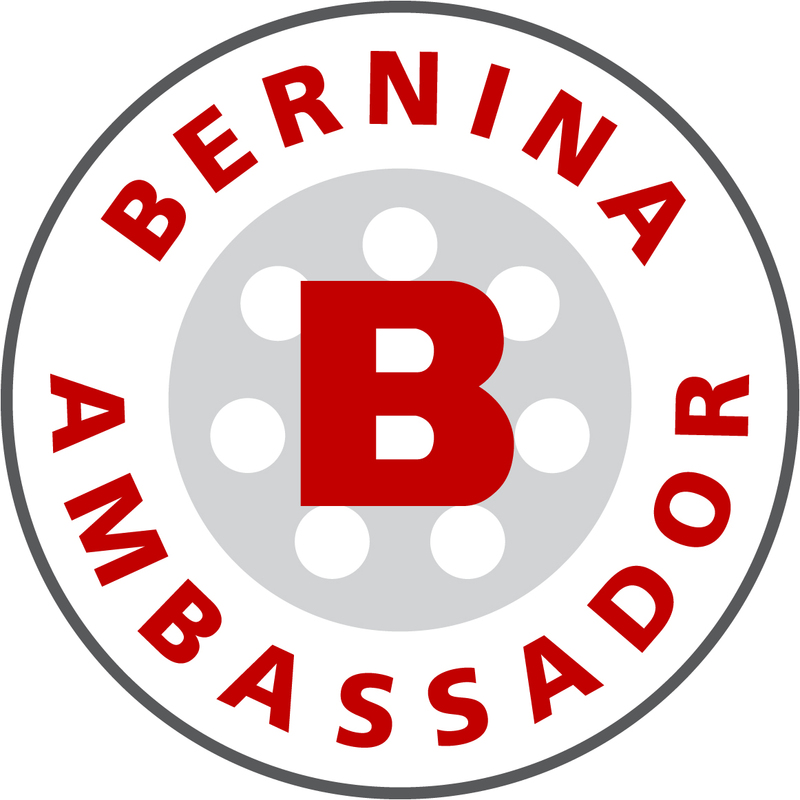 It’s a free tutorial that’s part of JetSetSewing.com’s partnership with BERNINA of America, and you can find out all the details by clicking the “Bernina Collaboration” tab. 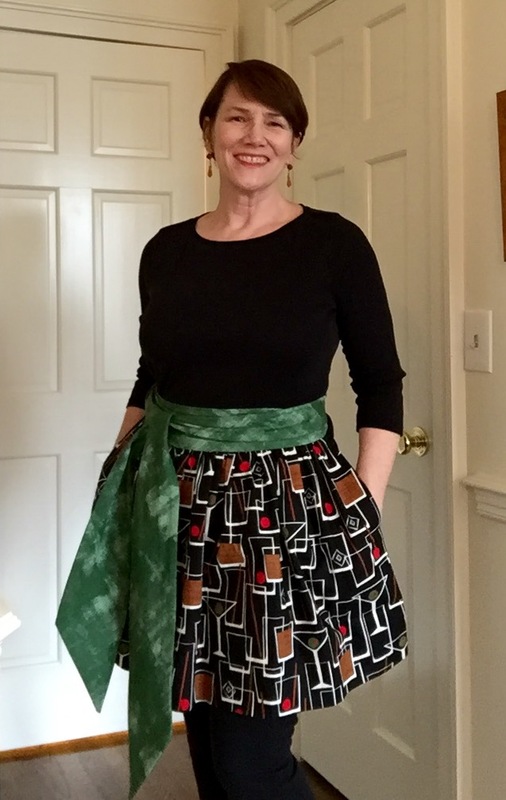 I have to thank them again for loaning me my fab B560, Karl, who is the only thing in my entire sewing area that hasn’t been acting up in recent weeks. I knew my luck had changed for the better when I got to meet the Elvis of haute couture, Kenneth D. King! More details about that will be coming up soon. That hostess sash is divine! Thanks! I’m looking forward to the summer drinks that go with it. The silk prints from photos is very nifty, and the ‘look’ is quite high end. Good job! 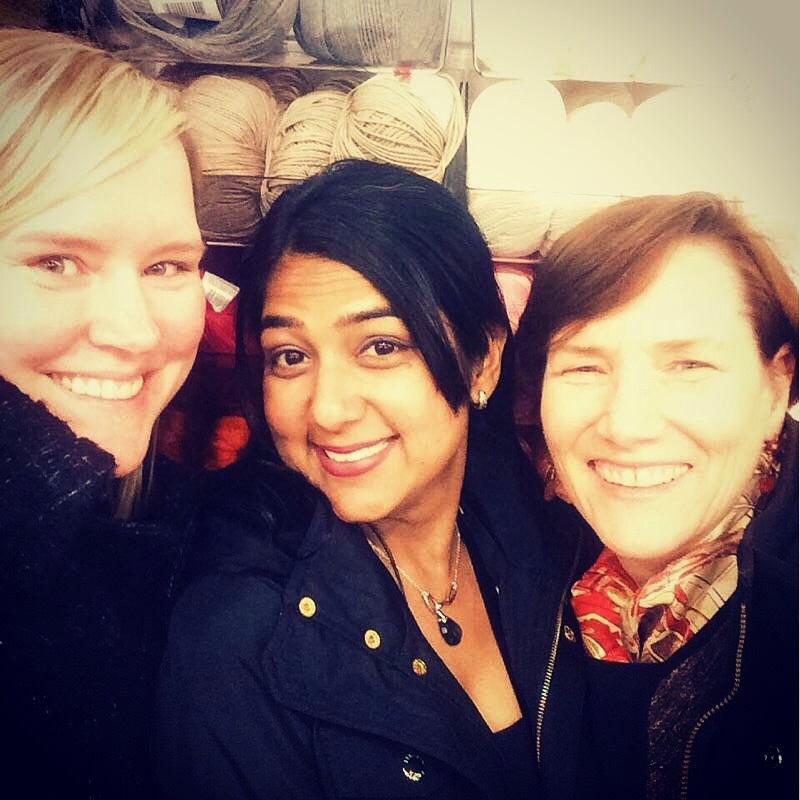 It is pretty, and I think they’ll make nice scarves. Well, you certainly made a silk purse from the kimono jacket. And what’s wrong with Bea Arthur? Spa days for everyone! I believe I made a screaming noise on the last photo. I look forward to the deets. Quick, before they all come home from school! And if not, have a swell summer! I love Bea Arthur but just am not ready to be “Maude” yet (though she was probably younger than I am when she played Maude)… Deets on the King coming soon! The hostess sash is a keeper. I love your Paris prints and will check out the service. Please post your project using them. Thanks Mary, I definitely will! And I see another hostess sash in my future soon. I better get going on sewing something from them! that’s exactly what i was looking for. i’m so glad i found this site, looking for cosplay info. what are the dimensions of that sash, width and length?? I think I cut it 12″ wide and folded it over. The length depends on your waist – you can use a string wrapped around a couple of times to figure that out. Good luck! Thanks so much! As for me, I’m working on a vintage wardrobe before I get too much further into GG territory.